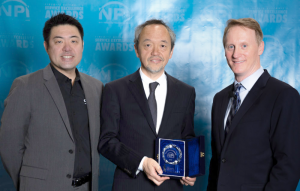 Fremont, CA – Saki Corporation, an innovator in the field of automated optical and x-ray inspection and measurement equipment, announces that it has received a 2019 New Product Introduction (NPI) Award in the Test & Inspection–Automated Optical Inspection (AOI) category for its Saki Self-Programming Software. The NPI award, sponsored by Circuits Assembly and Printed Circuit Design and Fab, part of UP Media Group, recognizes a product’s creativity and innovation, compatibility with existing technology, cost-effectiveness, expected reliability, flexibility, performance, and user-friendliness. Saki Self-Programming (SSP) Software revolutionizes the electronic assembly process with the first software that programs AOI and solder paste inspection (SPI) in just a few minutes and clicks, instead of hours, without a golden board. Only Gerber and centroid CAD data are required. Programming is not dependent on the programmer’s skill. SSP enables quick turnover, high-mix/low-volume production, and program standardization. Recipients of the NPI Awards for electronics assembly equipment, materials, software, and PCB fabrication are selected by an independent panel of practicing industry engineers. The award was presented at the 2019 IPC APEX Expo, held January 28-31, in San Diego, CA.